Midleton CBS failed in their bid to reach the “Croke Cup” final, when they had to give best to a more clinical Athenry side that took their chances in this first semi-final played on a heavy surface in Fitzgerald Park Kilmallock. Midleton can have few complaints at the outcome, yet they will surely have plenty of regrets, especially in the opening half, where it took them 21 minutes to registrar a score, despite playing with a strong breeze. In was perhaps in this period that the game was lost as Presentation Athenry began well with TJ Brennan getting their opening point. Corner forward Mark Kennedy who was later to emerge as man of the match added a second point in the 4th minute before Midleton let a goal chance slip with Jason Hankard failing to convert after good interplay by Cian Farmer and Joe Stack set him up. It was a huge let off for Athenry who further extended their lead with Mark Kennedy pointing a free in the 15th minute. Midleton for their part were trying hard but getting little change from a tough Athenry defence where team captain Shane Quirke stood out. Midleton did manage to get off the mark in the 21st minute with Ryan McCarthy pointing a free. This was quickly followed by a fine point from Joe stack to cut the lead to a point. Athenry were then awarded a penalty when Adam Clarke was grounded, but Jack McGann in the Midleton goal denied Mark Kennedy with a fine stop, putting the ball out for a 65. Kennedy duly obliged from the 65, before Joe Stack came up with another super score to keep Midleton in touch. Midleton then hit the front as Hankard was taken down with Ryan McCarthy converting the penalty to put Midleton in front for the first time, 1-3 to 0-4. Athenry finished the half as they had started with Mark Kennedy pointing to leave Midleton leading by 1-3 to 0-5 at half time. Given the conditions it was Athenry who would have been very happy with their first half display although Midleton got off the mark first in the second half with Ryan McCarthy converting a free. 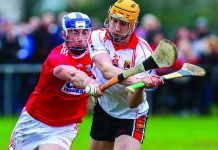 Athenry had it back to a one-point game with a fine Adam Clarke point before Athenry went back in front with Mark Kennedy flicking the ball to the net after Jack McGann had done well to save. Midleton were certainly playing much better in this half with Daragh Moran and Peter Hassett doing well in the half back line, winning some relieving free’s. Here Ryan McCarthy might have been better to let the ball drop short as on three occasions he shot wide. Midleton were contesting every ball and their effort was rewarded with Ross O’Regan putting Midleton back in front as he smashed the ball to the net. In an altercation that followed O’Regan was shown a straight Red Card which was a big blow to the Cork side. Minutes later the numbers were level again as Athenry full back Christy Brennan also received his marching orders for a careless pull. It was then that Athenry probably made the game winning move as Mark Kennedy was deployed outfield and the diminutive corner forward was like a magnet for the ball. Midleton saw Joe Stack fire over his third of the day before Kennedy pointed a free to leave it 2-5 to 1-7 going into the final quarter. With Kennedy now turning up all over he place points from TJ Brennan and Adam Clarke along with Gavin Lee saw Athenry go two points in front once more. Kennedy with a point from play made it a three-point game as Midleton were beginning to struggle. Adam Brett extended the lead to four before Ryan McCarthy landed a free for Midleton who now really needed a goal. Jason Hankard might well have had a second penalty, but referee Fergal Horgan did not give it. Midleton who are known for their late goals really needed a green flag and while Ryan McCarthy lobbed in a few balls the Athenry defence held firm to secure their place in the All -Ireland final. Midleton will certainly be disappointed as they could have been a bit more clinical at times. They failed to deliver in the opening half and just gave themselves an uphill climb in the second half. The heavy pitch did not help either side but when Midleton look back on the video they will know that had they taken a few different options they may well have come out on top. Midleton CBS: R McCarthy 1-3, J stack 0-3 and R O’Regan 1-0. Presentation College Athenry: M Kennedy 1-6, A Clarke 0-2, TJ Brennan 0-2, A Brett and G Lee 0-1 each. and Artur nGanou for C Hickey. and Liam Leen for A Brett.